I hope you are all having a great Sunday! I am slowly getting back to schedule. During my travels, I spotted Chanel Summer Collection at Amsterdam Schiphol Airport. With duty free prices, I was unable to resist and ended up going overboard. I shared my haul with you on Instagram, together with the fun fact that the ladies at the counter suspected that I was a beauty blogger and wanted the link to my blog. This is how we haul right? Expect to see lots of Chanel next week. As I mentioned earlier, I have an important appointment on Tuesday but I am doing my best to keep up with the blog. A few comments may look like ignored at the moment, but they are not. They will all be answered very soon. I have played with Chanel Summer nail polishes yesterday and today. I wore the purple one yesterday and switched to Terrana today because I was not satisfied with the swatches. 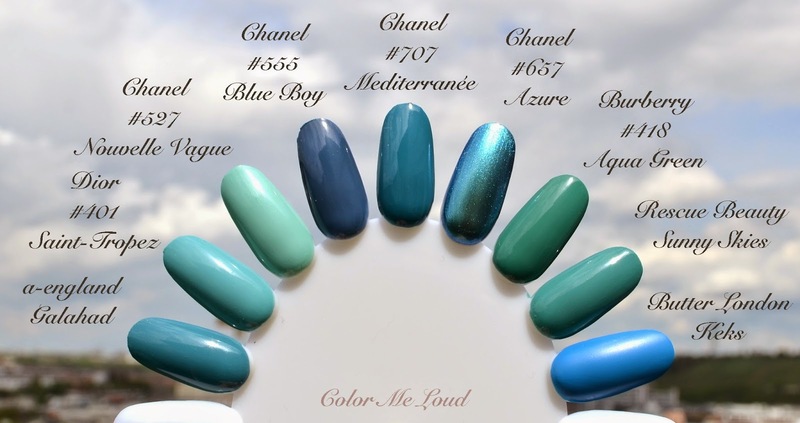 I will explain more about it, so let me start my review for one of the most exciting nail polish release of this year, Chanel Le Vernis #717 Coquelicot, #707 Meriterranée, #727 Lavanda and #697 Terrana for Méditerranée Collection. 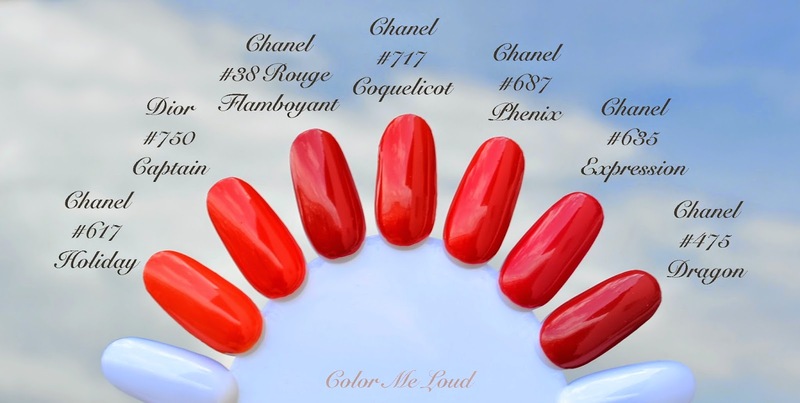 I would like to start with the classical option of the four, Chanel Le Vernis #717 Coquelicot. It looks like Chanel Collections are only complete with a gorgeous red nail polish, which Chanel does to perfection. #717 Coquelicot is not an exception. It has great formula, consistency is perfect. It applies smoothly by the first coat but two coats are needed for opaqueness. I am wearing two coats below. IU didn't expect to love this one but I do. It is not too bright, not too orange, Coquelicot is a very pretty summer shade. Coquelicot means poppy and it describes this shade perfectly. I have swatched a few bright reds from my stash together. I don't claim that this is a complete comparison, I have around one hundreds reds at the moment. Each time there is a red release, it takes forever to find the right shades, lol, I hope the ones you would like to see are covered. A recent release, Chanel #687 Phenix (reviewed here) is quiet close but a tad cooler. Chanel #635 Expression (reviewed here) is a little deeper. Chanel #38 Rouge Flamboyant (reviewed here) is also deeper. Dior #750 Captain (reviewed here) is brighter. Chanel #617 Holiday is warmer, more orange. I also included a classical Chanel red, #475 Dragon, which is deeper and cooler. 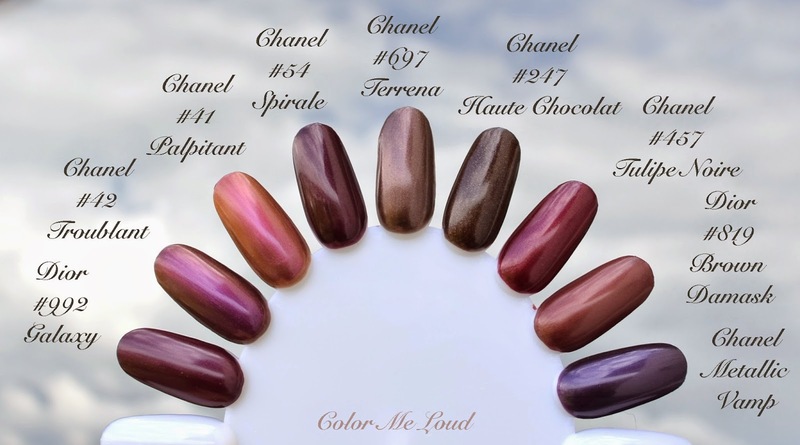 An interesting shade release is Chanel Le Vernis #707 Meriterranée. Chanel released light baby blues and shades of blues as well as some turquoise but, to my knowledge, this is the first teal in the line. I hear that it is going to be permanent, which is great news for blue/green nail polish lovers. The formula of Meriterranée is a little thick but applies smoothly and it covers the nail in only one coat! I prefer two coats for longevity reasons, below swatch is done with two coats. Here are some blues and greens from my stash. I thought I had to have a shade which is very close to #707 Meriterranée but it seems I don't. The closest teal shade, a-england Galahad, is a tad lighter. Dior #401 Saint-Tropez and Chanel #527 Nouvelle Vague are both much lighter, turquoise. Chanel #555 Blue Boy is close from the intensity and more blue (less green). I included Chanel #657 Azure although it has metallic finish, the shade is close. Burberry #418 Aqua Green (reviewed here) and Rescue Beauty Sunny Skies are both greener. Now that one shade I was waiting for, a vivid purple, so not like Chanel. In the past, they had released deeper purples, almost blackened shades and lilacs. 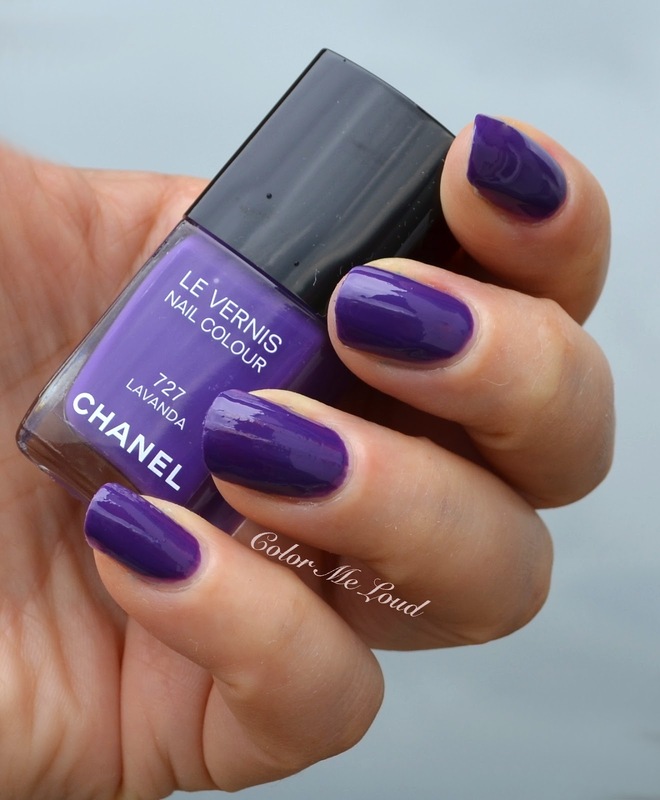 Chanel Le Vernis #727 Lavanda though surprises Chanel fans and pleases team purple, such as myself. A big yay! But... have I seen this shade somewhere? Before we check this out, a few notes about the formula. It is self-leveling, applies beautifully, consistency is great. It is somewhat streaky with the first coat but evens out nicely with the second, so no issues there. I love the balance of red and blue in this one, breath taking. Once I swatch close colors on the nail wheel, my feeling of having seen his somewhere is justified. Dior released very limited amount of nail polishes, with their Anselm Reyle Collection a few years ago. One of the colors, called Ultra Violet is an almost spot on dupe for Chanel Le Vernis #727 Lavanda although it is very slightly warmer. From permanent YSL line #16 Mauve Naif is also quiet close, again a tad warmer. OPI Do you have this color in Stockholm (one of my favorite recent OPI colors) is slightly cooler but also close. Other Chanel Shades don't come close, that way this shade is unique in Chanel line-up. 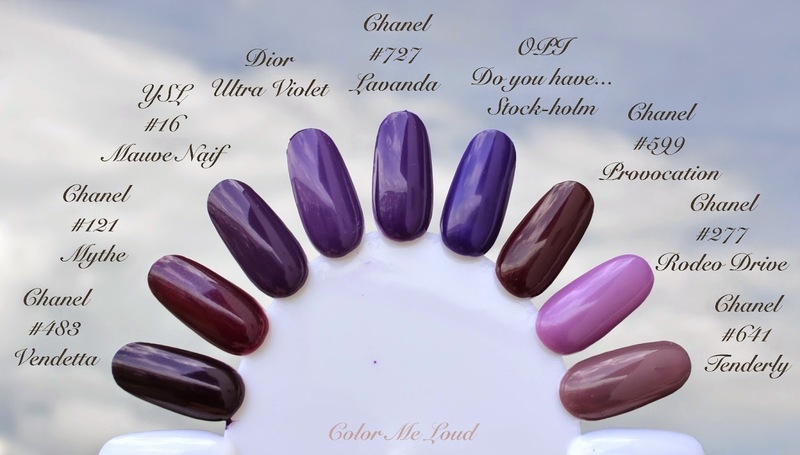 Chanel #277 Rodeo Drive is more lilac and lighter, Chanel #641 Tenderly is more brown, Chanel #483 Vendetta is deeper and one of my all time fav Chanel purple, #121 Mythe is warmer (because it has gorgeous red hidden shimmer, *happy sigh*). I saved my favorite to the end. 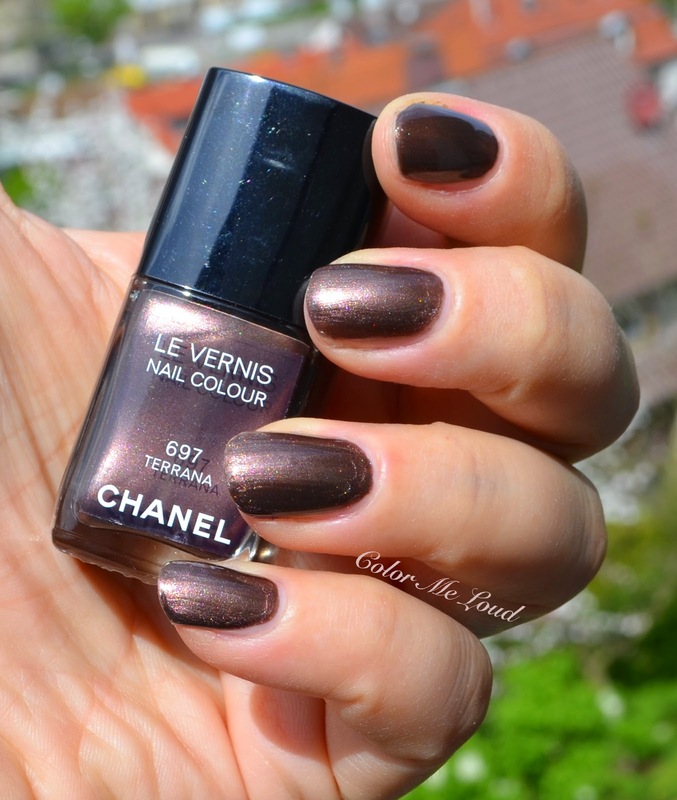 Chanel Le Vernis #697 Terrana is a plummy brown with multi colored shimmer under the sun. It is a very pretty complex shade which make a nail polish lover's heart skip a beat. Also don't worry if you think it is too brown, because it isn't, it has cool undertones which would make it look good across complexions with different undertones. The only issue with #697 Terrana is that the consistency is a little thin. It is completely opaque with two coats and it doesn't show streakiness but if you don't wait enough after the first coat, you may get bubbles, which I have at the moment because I rushed through the application. Still I think this shade is a must have from this collection. I have swatched all interesting shades from my stash in vain. I don't own anything like #697 Terrana. The closest shade must be Chanel #247 Haute Chocolat, which is deeper and warmer. Chanel #54 Spirale is deeper and has more red. Chanel #41 Palpitant and #42 Troublant looked like they might be related in the bottle but swatched there are worlds apart. Also Dior #992 Galaxy and Chanel #457 Tulipe Noire has more red. An older Dior shade, #819 Brown Damask is a warm version of Terrena. Chanel Metallic Vamp is too purple, it would indeed fit better to the comparison with Lavanda. By the way would anyone be interested in a post about Chanel Vamp Collection? I have collected them all some years ago and I would be happy to share. Final thoughts: I am loving the nails polishes from Méditerranée Collection for Summer 2015. After very boring releases from other brands, these are like fresh breeze from the sea. My favorite is #697 Terrana which is a lovely complex shade and the only limited edition one, so make sure to get your hands on one. #707 Meriterranée and #727 Lavanda are both not that much Chanel but so pretty too. If you prefer a poppy red for summer, check out #717 Coquelicot. Are you eyeing any of there? Which one is your favorite? Hahaha I know, I was exactly like this! Part of me wants that red, but few formulas can handle the mess that I call my nails, and Chanel is one of the worst for my nails, taking huge chunks of nail with it as it chips. So I've limited myself to Taboo and Azure, and save them for special occasions. OK sooo I've tried Coquelicot and Mediterranee on so on and I love both! Would definitely love to lay my hands on Terrana once it becomes available as well! The poppy is so summery, the teal is a big surprise for me, very pretty. And the purple is so sophisticated looking. Love them! How does Terrana compare to Tom Ford Minx nail polish from a few seasons back? Meriterranée & Lavanda I thought were my favourites based on pictures I have seen previously, but wow Terrana is so gorgeous! I'm so happy I'm not a polish fan. I cannot paint my nails. Every attempt finishes with me being painted from tips of my nails up to my elbows. I usually keep my nails clear or done by a pro. I own one red varnish and that's it. Obviously I read the post even though I'm not going to buy them. I just can't get over the fact how professional you are (and other bloggers I found through you)! Minx is very close to Dior Brown Damask and therefore much warmer (and also a little redder) once compared to Terrana. Thanks for asking, I swatched it just a second ago, it is very different, not even close. Yes I know. I was like oh another brown polish but when I see it in person, I was head over heels with that one. It is so unique and looks so different with each light. Very beautiful. LOL yes and the list goes on. Wait until you see Terrana in person, you will fall in love with that one too. I think this summer Chanel nailed it with their nail polishes. They always do but this release is even more special! yes you need that one. it is very special really. I am glad you like the others too. I think I like all of them hahaha. Hahaha you cracked me up telling that OPI shade was sold out in Stockholm :-) That shade was one of my favorites from Nordic Collection and was also sold out pretty quickly here. Bap Bao Wan nail polish is warmer but somehow have a resemblance, yes. But the formula of that one was so bad, I am not going to wear it ever again. Armani Runway one dries matte and is very deep, is nothing like this one. I had splitting nail problem as well. I am thinking it is less to do with the nail polish, more about how you hydrate the cuticles. Crazy as it sounds, each time I don't use a cuticle cream and massage them at nights for a few minutes, my nails split much easier. I can recommend Lush Lemon Futter (or whatever the name is). It is just 10 bucks and does miracle to mine. Right now my nails are very short because of traveling. With suitcase around, they tend to break easier. Taboo is beautiful! Azure too, both are very special. I am buying all of these! 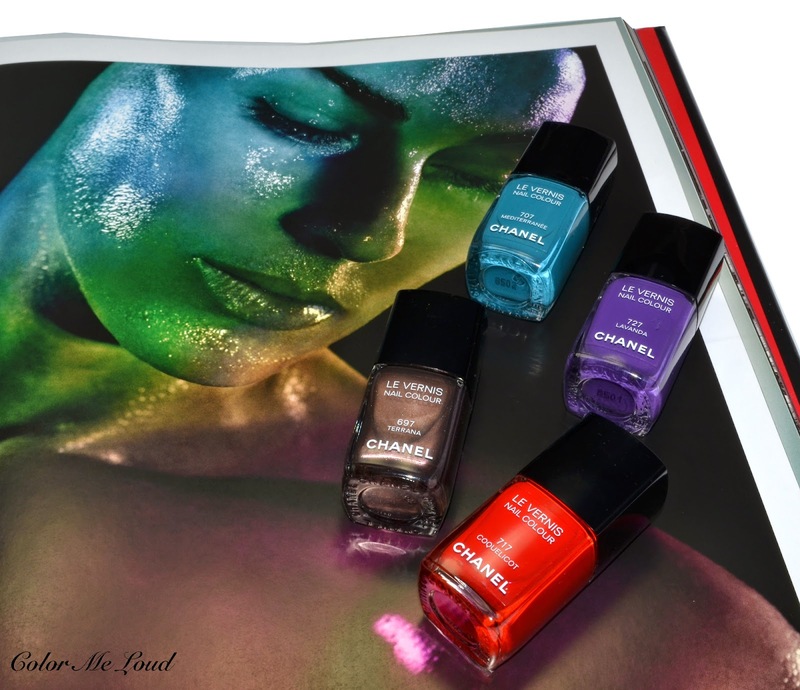 I'm a Chanel polish lover and am so thrilled to see such bright, interesting colours that are unique to the line. Particularly after last year, when it seemed like they released so many reds. I always like seeing Chanel polish swatches, so I would be happy to see a Vamp collection post! I'm so jealous of your Chanel polish collection; it seems like you have a lot of HTF colours! I think Lavanda is gorgeous but then again, I love purple polishes. Thank you for the wonderful review and swatches! It doesn't sound crazy at all, but I've tried all of it to no avail. It's not the nailpolish in itself that causes it, but it gets worse with the formula. YSL polishes seem to work better, as well as Nails Inc. This is all terrible for the hoarder in me as i want all the polish, but then I couldn't pick up all of the bronzers. I tried one from Smashbox at work today, and I think it's coming home with me some day soon! Hi Sara, thank you for all these swatches!!! I wasn't into these colors initially, and i still gotta think hard about the cream shades. Somebody showed me how Terrana is close to the LV brown, and i fell in love! But is it very duochrome? I'm not very fond of duochrome shades.... and bubbles?!?!?? Maybe there's something wrong with the bottle! Thanks for this comparison and swatch! Could you tell me if Dior Pandore is similar with Chanel Coquelicot please? Thanks. I am glad it was helpful. Unfortunately I don't have Pandore and I can't check it for you. Coquelicot is very lovely though, if you are a red nail polish lover, you can't go wrong with it. Terrana is not duo chrome. It is metallic with complex shimmer. I didn't know it is close to LV Brown since it is not even brown, more of a cool plummy gorgeousness. I think you should get this one, it is really unique. Bubble, ugh, maybe I should shake the bottle better and wait between the coats lol. I know! Me too, team purple lol. LOL Jess, I know what you mean. I was like "gimme all!!!" And yes I was also underwhelmed with so many red nail polishes. I don't want to see red for sometime but the red in this collection is something. I love it more than I thought I would. Oh that bronzer, which one do you get? The light or the dark one? Light one is on its way to me lol. I haven't decided yet, but I think the light one might be the best option. We also got some cheek and lip pencils that I have to try, so guess I'll be doing my makeup in the workplace come Thursday. Great post Sara, your swatches are always helpful!! oh that's a relief to hear! I don't like duochromes... I've been told not to shake the bottles... that's how bubbles form. But roll them between your palms upside down. Ooo you are completely right! Hi Jessica, I think your English is perfect really. I hope you enjoy Coquelicot. It is indeed a breath of fresh air and colourfulness compared to the soft pinks, corals and pastels! Definitely want to get my hands Terrana and Lavanda! Your post and comparison is the best on the planet, I was stalking websites to see the reviews on this, and I bought this as soon as Macy's got them. I love this nail collection, I got everything except Coquelicot, I don't want any more red/coral because I have enough to last me several lifetimes. But the others, wow wow wow! I love when Chanel does bold BIG colors, like the Papillon D'Ete from a few years ago. Terrana is fabulous, really stunning, great for my hands. I am wearing Lavanda on my toes right now, and Mediterranee will follow, they are the best pedicure shades to come along this year. Enjoy and have a great weekend!! Hi Sara, great post as always! A bit bummed I have to say that Lavanda is a dupe for Ultra Violet. I kind of thought it might be. Though I'll still get it as I much prefer the Chanel formula and brush. Shame the colour isn't a bit different though. Also do you have Rouge Rubis and Enthusiast? Do you think they're close to Coquelicot at all? especially the last offerings of Dior left me cold. I am considering not to collect them anymore. 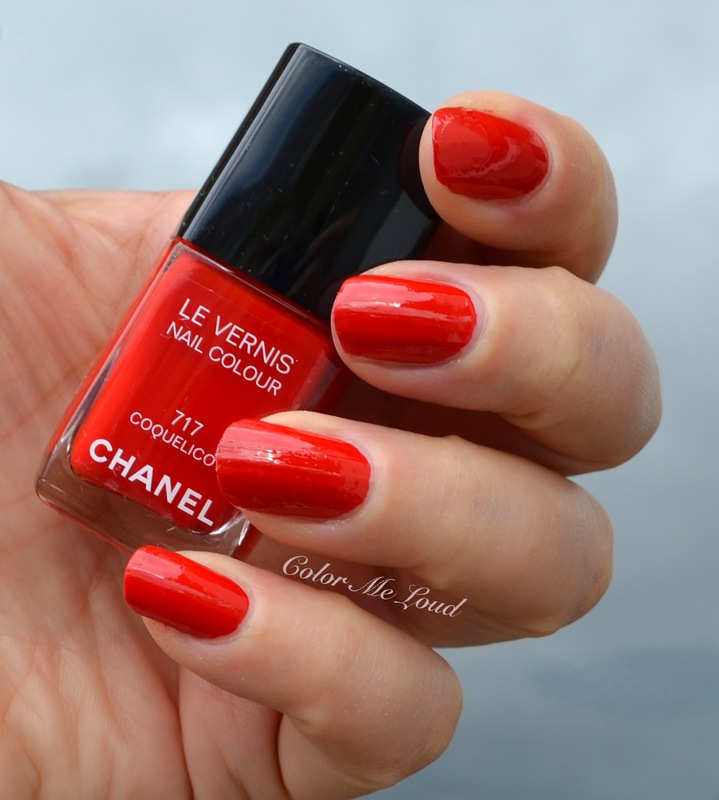 I was a little meh about last year's thousand reds too, but this time Chanel nailed it! So Rouge Rubis is also deeper than Coquelicot. Such a shame since I need it for comparisons. Is Schiphol cheaper than Amsterdam,in regard of cosmetics,for instance Diorskin star,Guerlain Shalimar...?I'm going to Amsterdam the end of the month and I'm veeery interested in order to shop better! Duty Free is always a little cheaper because it is without tax. I purchased each nail polish for about 18 EUR, which is a good price I think. Of course it is duty free, but I didn't find a very big difference on Orly in Paris that's why I asked.Thank you ,now I can compare the price from Douglas with the one you gave me . That's why I wanted to find out price range of cosmetics on Schiphol! I came across your beauty blog by accident but You gave me the information I couldn't get for months!Thanks!Enjoy your cosmetics rituals! Terrana looks New World Purple from Dior. Ugh, I broke that one, so I might get this if I see on sale. I don't like Chanel NP though..